Waterloons: Cycle path for Lexington overpass? Cycle path for Lexington overpass? 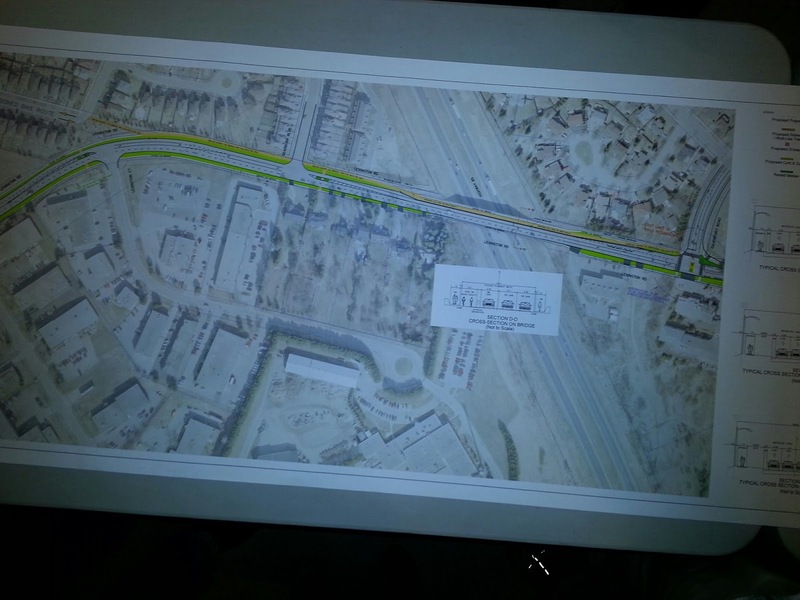 Wednesday night, Waterloo city staff presented their proposal for Lexington Road to the public. After three years of silence, we now get to see how we might bridge Waterloo's great cycling gulf. The proposal is an interim plan. Staff are telling us what they can do now, instead of ten years from now. As part of resurfacing Lexington Road, the city of Waterloo proposes to create a multi-use trail that turns into a 2-way cycle path over the highway 85 overpass. Because the overpass cannot be structurally modified, the idea is that this cycle path would take up a traffic lane and be protected from traffic by some form of barrier, possibly jersey barriers. The proposed multi-use trail will connect Davenport to Holbeach Crescent. That will get people on bike across the expressway, and provide connection through the neighbourhood to the Forwell trails and the rest of the Waterloop. This part of the Lexington corridor would turn into 2 eastbound lanes, and 1 westbound lane. Travelling further west, it opens up to 2 lanes by the time you reach the Dearborn traffic lights at the bottom of the hill. Further west, there are not many changes. So, why this plan? What's going on? Like I said, this is an interim plan. In ten to fifteen years, this road could be reconstructed. Before then, the city hopes to have acquired the land they need (especially around Weber) to create a permanent cycling solution while not constricting traffic. That's their goal. The bridge has been, and continues to be the worst problem. Anything the city does to it has to be approved by the MTO. Structural changes are extremely unlikely. Even what's proposed here still needs their blessing. The good news is that the MTO is apparently much more willing to consider this kind of plan now than they were four years ago. The last time this stretch of road came up, a proposal to reduce lanes to introduce on-street bike lanes further west was rejected and deferred by council. Possibly as a result of that, staff want to maintain 4 road lanes west of Dearborn leading up to Weber. What staff have presented fits within their budget. This means they don't need extra money to do this. But is it enough? What this proposal does is add a vital, safe cycling link across the expressway to connect Eastbridge to the Waterloop. Filling that gap is critical. So that's very good. It doesn't complete the Columbia/Lexington east-west corridor. That is a disappointment. To "do this right" would require the city to fund a new multi-million dollar plan that will take years, maybe a decade. Recognizing that, City staff rescued the idea of an interim plan from the scrapheap. They've come up with something that solves the issues that council raised with the previous proposal. They've done it cheaply, and they could have this in front of council for approval this fall, with potential construction in 2016. We need more of this imaginative problem solving. There are so many critical gaps and problem spots in Waterloo region's cycling network that need attention now. But there is only so much money to go around. If you punish staff for coming up with pragmatic solutions that can be implemented quickly, we will only see improvements when roads come up for full reconstruction, which means our network will only get random improvements going in haphazardly over the coming decades without regard to need. What this proposal does well is connect Eastbridge to the rest of Waterloo in a way that people of all ages can hop on a bike and use. That is the critical need. It also helps us build cycling numbers and that will in turn increase momentum for other incremental improvements. And it is a template for future problem-solving. Not every improvement needs to be as polished and completely conceived as Uptown's streetscape. What we need are pilot programs. We need staff and councils willing to engage in low-cost risk taking. We need to fill the gaps in our cycling network now, whatever way we can. That's why this proposal deserves a thumbs up. It's not the big win some people were hoping for, but it is definitely a win. And small wins over time add up to big gains. I like it. Agree that incremental steps are better than no steps, and cyclists should support this plan. Sorry Chris, I can't agree with this. This modification does virtually nothing for me. The main cases where I use this route, I'm coming from campus, every time, and this barely helps, I would have to go through uptown for a safe route. Their "long term plan" is to have full cycle lanes, while at the same time they're repaving the road to extend its useful life, but that will last 10-15-20 years, that's hardly temporary or interim. I shouldn't have to wait 20 years for a safe route. I'll be in my fifties by then, scary. As a result, I consider this plan entirely unacceptable. A road diet would provide the missing link, and without increasing costs at all. They claim traffic models won't support it, but I've seen the road at rush hour, it isn't congested. Queuing they blame, well, let cars queue, perfectly smoothly flowing car traffic isn't worth my safety. And, I don't believe they have tried all options at the intersections where queuing is apparently a problem. They felt a road diet would work before, why not now. And, this is a 50 km/h section of road where cars routinely exceed 70 km/h, a road diet would also help reduce excessive speeding on this section. And, if we find do find this unacceptable, than there is already room within the existing right of way, to build a multi-use trail all the way to Weber (but not through). That would be a big improvement, and no land acquisition needed, just have to move some hydro polls. If this *was* an interim solution, you know, we'll build this right now, and rethink it in a *few* years, I might get on board, but it isn't, this is how the road will look for the next 20 years, that's a majority of my adult life. I refuse to accept such a situation willingly. I think you and I want the same thing: complete the east-west cycling corridor along Columbia/Lexington. We probably have different ideas of what's possible, and when. I'll also point out that as someone coming from the direction of Uptown, I know this proposal solves my problem more than it solves yours. Most cycling infrastructure in this city goes in during road reconstruction, something that happens only every 30 years or so, or if widening is required due to traffic. The time from EA start to construction for projects that size is usually about 4-5 years. But Lexington isn't due for reconstruction yet. Unless there is real political will to get this done earlier, I believe it's a ten year wait for any real improvement. City staff said this plan was, as recently as last year, a simple repaving. So what we're looking at is their attempt to fix the worst of a bad situation now, instead of doing nothing at all. That's pretty stark. I'm not trying to suggest that's sufficient for your needs, and I know it won't be sufficient for a lot of potential riders trying to get from Eastbridge to the University areas. But it will benefit a lot of other potential riders while also reducing the scale of the remaining problem to be solved. Both of those things make filling the remaining gap easier and more of a priority. If you think a full solution in a sub-10 year timeframe is possible, then you should pursue it. But I don't see that possibility. My experience, having watched a plan for this stretch die on the vine once before, is that Davenport to King (or even Weber) is too big to solve in one bite. I see the trail proposal as something that could be extended incrementally, including out to Columbia/Weber, and then beyond. A beachhead across the bridge will make an extension more and more compelling, while solving a real problem today. That's why I support this. That's a fair position, but I think my point still stands, they had a plan which does work, there is another option, which also does work, and they're choosing neither, instead making a promise that maybe in 20 years, when they rebuild the road, they won't decide to make the same choice twice. I'll be in my fifties then, and at this point, I very much doubt I'll live here. Yes, it was unfortunate to see the previous plan not go anywhere, but the situation is different now. Now we've shown we can do road diets on minor roads like Davenport, and even on major roads like King. Yet we're giving up here. I would suggest that both of my proposals are feasible, with the proper political pressure, but I don't see that happening if we all throw our hands up in the air and continue to accept "hey, its better than nothing". Daniel, I agree. The 2012 report to council proposed a road diet with full on-road bike lanes. I believe this still makes the most sense. I couldn't attend the meeting last night - was there any indication as to why they don't want to go with the previous proposal of a road diet and on-road bike lanes? The stated reason: Staff believe they need 4 lanes west of Dearborn. Eastbound pm traffic, in particular, warrants 2 lanes. My thoughts: staff are not going to bring the same plan in front of council when it was shot down 3 years ago. Especially when this council is mostly unchanged. On Twitter, former councillor Scian said that they asked about a trail option and were told it was impossible-- now a trail option is on the table, with a friendlier MTO with a mandate to enable more cycling province-wide. If you want to urge council to pursue a road diet through Marsland, go for it. It's not a hill I'm willing to die on again. I see this plan as stage 1 of a trail that could reach all the way to Weber in coming years, and if it doesn't go through, we'll be twiddling our thumbs waiting for brand new asphalt to wear down before we have anything. So specifically they say that traffic queue lengths at the lights are the reason that won't recommend a road diet. To my mind, this opens up many other options, roundabouts allow traffic to flow better. And again, this is queue lengths, not congestion, the road is well under traffic volumes, I believe perfectly served by a two lane road, with the exception of the lights. Even when it came to lights, staff were light on details as to how much. I'd be very curious if this was more or less than going down to one lane in uptown. As for a trail, there is a full boulevard on the road all the way to Weber, they could put in a trail all the way to Weber, at a cost of moving the hydro polls. This isn't even an option they're willing to present to council, the reason being simply cost. I would pursue the road diet though, the road has other problems, as I said, there is serious speeding problem, that aren't going go get any better with a smooth coat of asphalt. If the fear is that council will throw out the proposal, and do nothing, that's one thing, but I don't think that's an option now. The road is in need of resurfacing. So doing nothing is no longer possible. Do you feel that the response would be to switch to doing nothing and simply repaving? That would appear to be vindictive, I really don't think staff or council would do that. The only thing that might happen is further delays. Which as I point out, I'm not terribly worried about, given that for me, for my use case, I'm looking at a 20 year delay right now, which realistically means never. > Do you feel that the response would be to switch to doing nothing and simply repaving? Well, this is what I made reference to earlier. I was informed that the internal plan as recently as last year was to simply repave, and revisit the whole mess in 10-15 years. If cyclists oppose this plan, and drivers oppose this plan for even the minute amount of lane reduction, this plan dies. What happens after that is a wild card. Maybe all or nothing turns into "all". This time, I just don't feel it. Are staff and council really unable to grasp the subtlety of, this plan isn't good enough, do something better, rather than, this plan is bad do something else? I'm not saying it isn't an improvement, I'm just saying for many people like myself, its really not much help. And are we really believing the 10-15 year number? I don't think I believe that, resurfacing the road will last at least 15 years, they aren't going to revisit it before then. And then, as you mentioned, its a 5 year project. So 20 years is the earliest it could ever happen. If I look at the regional TMP they don't even have Lexington listed for widening in the 20+ year timeframe (the longest timeframe in the plan), how do we know in 20 years, the same argument won't be used. I see no difference between then and now. And to top it off, this cycling route has existed in the 2-5 year cycling plan since 2004. If this is how we treat the 2-5 year cycling plan, we might as well give up on the cycling plan, because it simply isn't going to happen. On a side note, University was under heavy construction all last summer, from Weber all the way to almost Bridge St. There is obvious fresh new pavement there across that dangerous (for cyclists) highway overpass. Over and over again, I see streets repaved, including the removal of curbs, and they do NOT put bike lanes in. I was pretty sure I heard that the master plan says that they HAVE to. It's very disappointing. +1 to this. I was also disappointed when I saw the bike lanes, they're very narrow, in some places, well below the 1.5 meters, and also, cars are speeding excessively near the highway, to be honest, I wouldn't even use the bike lanes across that interchange if it had them. This is why Lexington is so important, its the ONLY route which doesn't have an interchange and thus is really the best route for cycling. The TMP says this, and said that bike lanes should be added in the 2-5 year time frame. That was 4 years ago. Apparently that should have been 25 year time frame.